The aim of the study was to evaluate the effectiveness and complications of mitomycin C (MMC) use in subscleral trabeculectomy surgery. MMC is an antimetabolite agent used to limit the scarring process, which is the main cause of failure of subscleral trabeculectomy surgery. However, it may increase the incidence of adverse effects. A prospective interventional study involving 35 eyes of 28 patients having glaucoma was conducted. All of them underwent subscleral trabeculectomy with adjuvant intraoperative use of MMC (0.2 mg/ml) for 2 min, and were followed up for at least 9 months recording intraocular pressure (IOP) testing, best corrected visual acuity, Seidel testing, bleb grading according to the Indiana bleb appearance grading scale, and complications if present. The mean IOP decreased from 32.03 mmHg preoperatively to 13.83 mmHg at 9 months postoperatively. The mean IOP drop registered was 56.82%. Overall, 29 (82.9%) eyes ended with complete success, three (8.6%) eyes ended with qualified success, and three (8.6%) eyes failed. The incidence of complications was 51.5%, and most of them were transient and self-limited conditions. Further management, including both medications and minor procedures, improved the postoperative outcomes. MMC of 0.2 mg/ml used for 2 min intraoperatively is an effective adjunctive treatment in patients with glaucoma; however, with this dose, it is associated with some complications. So it is a double-edged weapon that should be used wisely, only when indicated, with optimum concentration and duration. Glaucoma is the leading cause of irreversible blindness worldwide, affecting an estimated 60 million people in 2010 . Trabeculectomy is an effective surgery for lowering intraocular pressure (IOP); however, success is limited by complications . The main cause of failure of glaucoma filtration procedure is a wound healing response that leads to postoperative subconjunctival scarring in the filtering tract and bleb . Conjunctival scarring can cause adhesion to the episcleral tissue, resealing the bleb and preventing aqueous outflow . Mitomycin C (MMC) is effective in limiting the scarring process , and it has been used at different concentrations between 0.01 and 0.5 mg/ml . The Indiana Bleb Appearance Grading Scale is an attempt to unify and expand on previous classifications systems based on filtering bleb morphology and thereby to establish a simple standardized method of bleb grading . Supported by previous morphologic observations, height, extent, vascularity, and Seidel testing are the primary bleb features bearing the greatest clinical significance on outcome . With the advent of antifibrotic agents such as MMC, we are able to achieve lower target IOP; however, many complications have been reported such as encapsulated blebs, shallow anterior chamber (AC), cataract, choroidal detachment, endophthalmitis, fistula, hyphema, early hypotony, late hypotony, and hypotony maculopathy . The aim of this study was to evaluate the effectiveness and complications of MMC use in subscleral trabeculectomy surgery. A prospective interventional study involving 35 eyes of 28 patients having different types of glaucoma was conducted. All of them underwent subscleral trabeculectomy with adjuvant intraoperative use of MMC (0.2 mg/ml for 2 min). These patients were selected from the outpatient ophthalmology clinic of Menoufia University Hospital from January 2015 to January 2016. All the patients underwent complete history and ophthalmological examination, including: number and types of medications during 3 months preceding trabeculectomy, best corrected visual acuity, concurrent ocular diseases before or at the time of surgery, history of intraocular or extraocular surgery that involved the conjunctiva, slit-lamp examination, fundus examination with optic disc evaluation, IOP recording (two recordings on separate days, between 10 a.m. and 12 p.m.) using the Goldmann's applanation tonometer, gonioscopy using the Goldmann three-mirrors contact goniolens and angle grading using Schaeffer's method, perimetry to assess the field of vision and to document glaucomatous damage. The patients signed a consent form for intervention after explaining to them the advantages, disadvantages, and risks of possible complications, and they were periodically followed up for at least 9 months after the surgery. The study was approved by the Ethical Committee of Menoufia Faculty of Medicine. General anesthesia or peribulbar anesthesia or subtenon anesthesia was initiated followed by sterilization with betadine 10% for the eye lids and surgical field. Betadine 5% eye drops were used for the conjunctival cul-de-sac. Application of sterile drapes was performed. Corneal traction suturing was done by 7/0 vicryl suture at the upper cornea with exposure of the superior part of the bulbar conjunctiva followed by fashioning of a fornix-based conjunctival flap using Westcott scissor. Thereafter, wet cauterization to the sclera bed is done for good hemostasis. Cellulose sponges soaked with MMC (0.2 mg/ml) were applied under the conjunctiva, for 2 min, and then copious irrigation of MMC with sterile saline solution was done. Fashioning of a rectangular half-thickness scleral flap (3.5 mm × 3.5 mm) was carried out using a super blade knife, then dissection of a limbal-based scleral flap using crescent knife, and then excision of trabecular meshwork block (2 mm × 1 mm) using either Keely's punch after using MVR 20 G or by using Vannas Scissors after marking with super blade knife. Peripheral iridectomy is done using Vannas Scissors, and then suturing of the sclera flap was done by 10/0 nylon sutures. Assessment of filtration is done by injecting lactated ringer solution into the AC through the paracentesis. Additional 10/0 suture may be needed in cases with excess filtration, and then suturing the conjunctiva with interrupted water-tight sutures. Finally, suturing of the conjunctiva to the corneoscleral junction with a 10/0 nylon suture was done. Injection of the lactated Ringer solution into the AC through the paracentesis was performed to assess the filtration and to form the bleb. In the early postoperative period, all patients were treated with topical antibiotics five times daily and corticosteroids hourly for 1 week, and then both are tapered gradually over 4–5 weeks. There were eight postoperative follow-up visits within 9 months of surgery at 1 day, 1 week, 2 weeks, 1, 2, 3, 6, and 9 months, postoperatively, to record IOP using applanation tonometer, best corrected visual acuity, Seidel testing, bleb grading according to the Indiana bleb appearance grading scale, and number of IOP lowering medications if required. These were defined as follows : complete success is defined as an IOP less than 18 mmHg at 6 months of follow-up after surgery without antiglaucoma medications or at least a 20% reduction from baseline IOP, qualified success is defined as an IOP of less than 18 mmHg with one antiglaucoma medication, failure is defined as IOP more than 21 mmHg or not reduced by 20% below baseline on two consecutive follow-up visits after 3 months despite medication, and severe hypotony with IOP less than 5 mmHg on two consecutive follow-up visits after 3 months, with additional glaucoma surgery, including postoperative needling. Data were collected, tabulated, and statistically analyzed using a personal computer with a computer statistical package (IBM SPSS statistics for Windows, version 22.0; IBM Corp., Armonk, New York, USA). The hypothesis that the row and column variables were independent, without indicating strength or direction of the relationship. Pearson c2 and likelihood-ratio c2 are computed. P value less than or equal to 0.05 was considered significant. It is a mathematical method used to determine which explanatory variables predict the outcome, when the outcome is a binary variable. We used it as a risk measure to determine the estimated odds ratios for each complication based on the preoperative IOP with a 95% confidence interval. Receiver operating characteristic (ROC) curves are used to find the cutoff point in a continuously distributed measurement that best predicts whether a condition is present. ROC curves are plotted by calculating the sensitivity and specificity of the test in predicting the diagnosis for each value of the measurement. Of the 35 total operated eyes in the study, 18 (51.4%) were of males and 17 (48.6%) of females, The age range of the patients was from 19 to 72 years, with mean age of 53.46 years. Follow-up period ranged from 9 to 20 months, with mean of 13.11 months. All the patients were from the local population (Egyptians). The preoperative IOP ranging from 18 to 52, with mean IOP of 32.03 mmHg, with 19 (51.4%) of them were on medications. The postoperative IOP on the first day range was from 0 to 28, with mean IOP of 11.46 mmHg; after 1 week, the IOP ranges from 0 to 28, with mean IOP 11.89 mmHg; after 3 months, the IOP ranges from 2 to 46, with mean IOP 13.83 mmHg; after 6 months, its range is from 2 to 44, with mean of 14.4 mmHg; and after 9 months, the mean IOP was 13.83, with range of 2–32 [Table 1]. Of the 35 eyes underwent surgery, 29 (82.9%) eyes ended with complete success, three (8.6%) eyes ended with qualified success, and three (8.6%) eyes experienced failure. Early hypotony is the most common complication, and it happened in six (17.1%) eyes from the 35 eyes performed. Shallow AC was noticed in six (17.1%) eyes [Figure 1]. As for bleb leakage, it happened in five (14.3%) eyes, and three (8.6%) eyes experienced conjunctival dehiscence that needed conjunctival surgical repair. 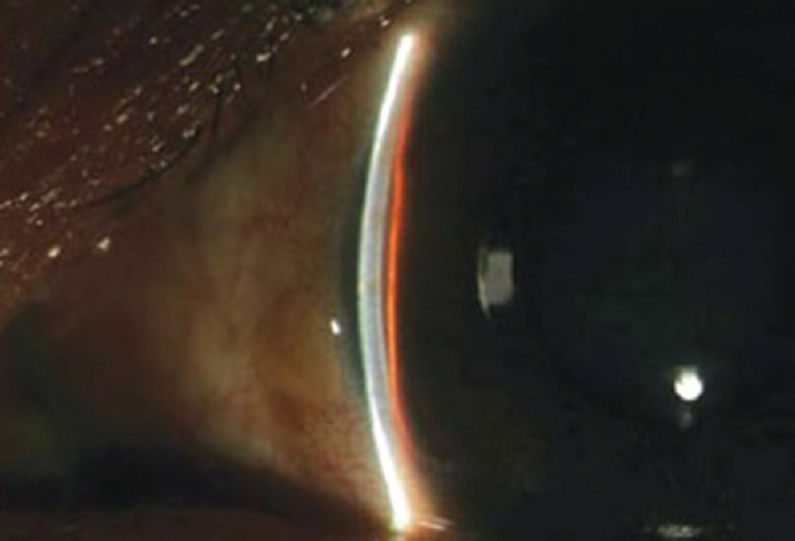 Complicated cataract was experienced in three (8.6%) eyes [Figure 2], and they all needed surgical cataract extraction. In addition, seven (20%) eyes had mild to moderate vascularized bleb; although its percentage is higher than hypotony and shallow AC, it was not serious enough as most of them were mild and only three eyes that needed 5-fluorouracil injection. Furthermore, two (5.7%) eyes had cystic bleb [Figure 3], two (5.7%) eyes experienced postoperative AC inflammatory reaction, two (5.7%) cases had postoperative choroidal effusion [Figure 4], and one (2.9% case was of hyphema). Moreover, one (2.9%) case had failure of filtration, which needed suture lysis, and unfortunately one (2.9%) case was of endophthalmitis [Figure 5]. 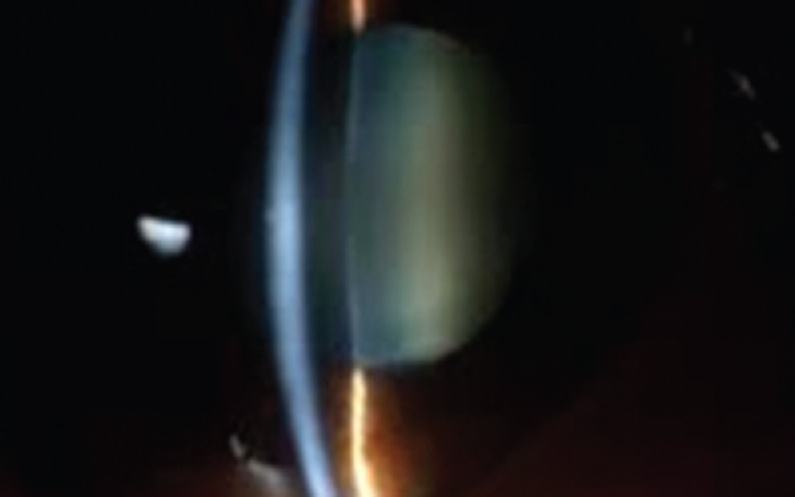 Figure 1: Postoperative shallow anterior chamber. 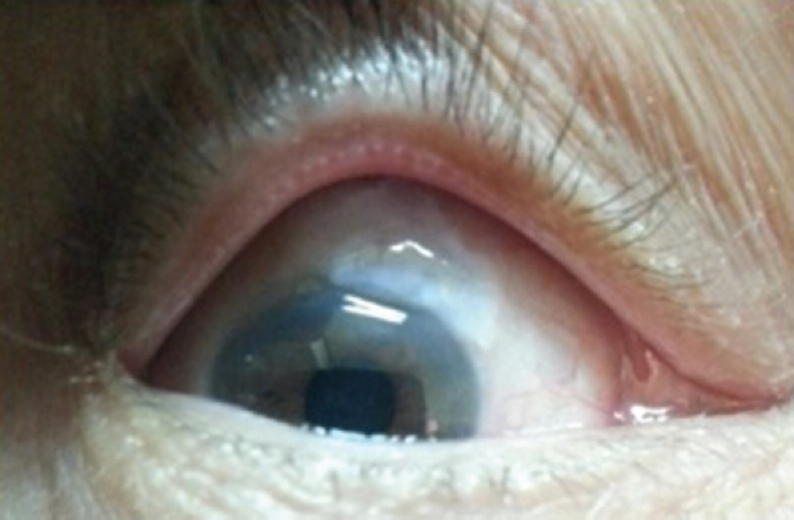 Figure 2: Postoperative complicated cataract. Figure 3: Postoperative cystic bleb. 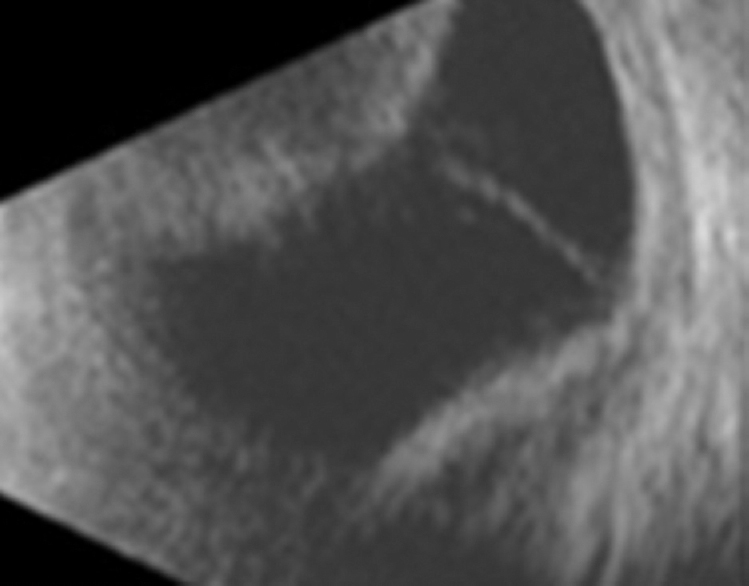 Figure 4: Postoperative choroidal effusion. A total of 16 (45.7%) eyes did not need any postoperative intervention and 54.3% of the eyes needed interventions including medical and surgical interference, two (5.7%) eyes needed therapeutic contact lenses to treat bleb leak, three (8.6%) eyes needed surgical repair of the conjunctiva to treat conjunctival dehiscence, two cases needed cyclodestructive procedures as cyclocryo to treat high postoperative IOP, four cases underwent cataract extraction surgeries, two (8.6%) cases needed massive steroids drops owing to postoperative anterior uveitis, one case of suture lysis, three cases with vascularized bleb needed 5-fluorouracil injection, and only one case needed intravitreal injection of antibiotics (Fortum and vancomycin) and continued on fortified antibiotic drops as a treatment of endophthalmitis, which was treated successfully. 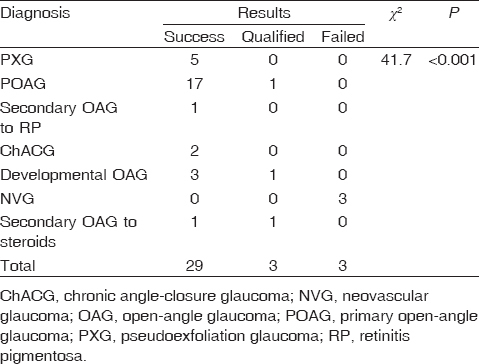 When correlating the diagnosis and the outcome of the operation, it was found that neovascular glaucoma is statistically significant to failure, and as for complete and qualified successes, both are statistically insignificant to diagnosis [Table 2]. When correlating the diagnosis and the occurrence of complications, it was found that it is statistically insignificant. As complications occurred nearly in all groups with different percentages, we made a correlation between the diagnosis and each individual complication and found that in some complications the correlation is statistically significant to the diagnosis such as bleb leakage, which is statistically significant to pseudoexfoliation glaucoma; AC inflammatory reaction, which is highly correlated to glaucoma secondary to steroids use; and hyphema, which is highly correlated to neovascular glaucoma. As for the rest of the complications, the correlation is statistically insignificant to the diagnosis. When correlating the preoperative IOP to the occurrence of complications, we can expect the occurrence of some complications from the preoperative IOP such as choroidal effusion, which happened twice in two patients with the preoperative IOP 52 and 54 mmHg, and hyphema, which also happened in high preoperative IOP (54 mmHg). This correlation was done using univariable binary logistic regression analysis [Table 3]. In addition, when correlating the preoperative IOP to the results of the operations (success vs. nonsuccess) using univariable binary logistic regression analysis, it was found that high preoperative IOP is a risk factor for failure of the procedure (P = 0.01) [Table 4]. When correlating the preoperative and day 1 postoperative IOP as a predictor of failure using the ROC curve analysis, it was found that preoperative IOP can be used as a predictor of failure of the procedure with an optimum cutoff point of 37 mmHg, with a sensitivity of 83.3% and a specificity of 79.3% at that cutoff point (P = 0.012). However, day 1 IOP failed to predict the results of the procedure [Table 5] and [Figure 6]. 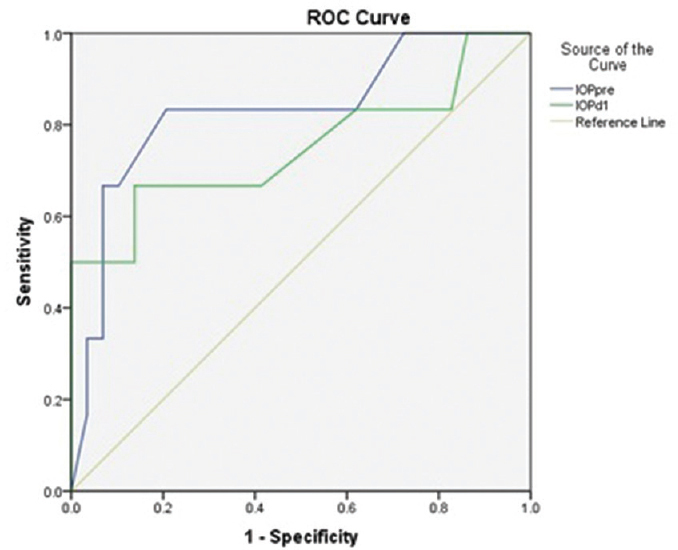 Figure 6: A receiver operating characteristic (ROC) curve showing correlation of the preoperative and day 1 postoperative IOP as a predictor of failure. In this study, the incidence of complications in the first 3 months after trabeculectomy with MMC was 51.5%, which is quite similar to the Collaborative Initial Glaucoma Treatment Study (CIGTS) , which found early postoperative complications in 232 (50%) eyes during the first month after initial trabeculectomy. A large national survey of primary trabeculectomy for primary open-angle glaucoma in the UK  also found early postoperative complications (within 2 weeks after the surgery) in 578 (46.6%) eyes. However, in another study that was conducted in Singapore  and had a higher proportion of patients with primary angle-closure glaucoma, surprisingly a low overall incidence of postoperative complications in only 65 (5.2%) eyes of 1262 eyes was found. Hypotony was a major complication in several studies including our study, which was quite high (17.1%) compared with other studies. In the UK study  (24.3%), and the Singapore study  (prolonged hypotony = 1.8%). The incidence of hypotony was low in CIGTS (0.9%), in which there was no use of MMC. Some studies excluded hypotony at day 1 after trabeculectomy, or hypotony was counted when a patient had hypotony in at least three consecutive follow-up visits ,. Surgeon factor also plays an important role in determining the early postoperative IOP, which includes the tension of sutures, number of sutures, immediate IOP at the end of surgery, and timing of suture lysis. Hyphema in our study was low (one eye, 2.9%) when compared with many other studies. As in many previous reports, it was found that hyphema resolves spontaneously within several weeks of the operation. It was the most common early-onset complication in the UK study (24.6%) as well as in the report of the population-based study in Minnesota (38%) . A recent report by Nakatake et al. showed that gross hyphema was statistically significantly associated with trabeculectomy failure in patients with neovascular glaucoma. The incidence of bleb leak in our study was 14.3%, whereas in other studies ,, that used a fornix-based conjunctival flap technique, it ranged between 0.9 and 30%. This disparity of early bleb leak rate is most likely because of differences in surgical techniques, especially with conjunctival closures and surgical skill. Bleb leak was the most common postoperative complication in a previous study (23.2%) . Even though Kohl and Walton  reported multivariant analyses from studies that early bleb leaks were not independent risks for bleb failure. Although the overall results in this series are encouraging, serious complications did occur and must be taken into account. First, there was only 1 case of early-onset endophthalmitis with the percentage of 3.5% which is slightly higher than reported in the literature ,, but on a par with a published report on early endophthalmitis after combined trabeculectomy and cataract surgery . In our study, we found three cases of complicated cataract with the percentage of 8.5%. In the Advanced Glaucoma Intervention Study , the Collaborative Normal Tension Glaucoma Study , and the CIGTS , patients who underwent trabeculectomy surgery had a significantly higher risk of subsequent cataract extraction during the follow-up period compared with patients randomized to nonsurgical treatment. Based on the recently published data, ∼50% of patients will require cataract surgery within the first 5 years of trabeculectomy surgery ,,. Despite the relatively high rate of early posttrabeculectomy complications in our study, they were transient and self-limited conditions. In addition, further management, including both medications and minor procedures, improved the postoperative outcomes. Adjuvant MMC is a double-edged 'weapon' in our 'scar wars'. It increases the success rate especially in the long-term follow-up, and it also increases the complication rates that not only threaten the prognosis of the surgery but also may lead to loss of vision. Therefore, it should be wisely used, when indicated, with optimum concentration and duration. Quigley HA, Broman AT. The number of people with glaucoma worldwide in 2010 and 2020. Br J Ophthalmol 2006; 90:262–267. Jones E, Clarke J, Khaw PT. Recent advances in trabeculectomy technique. Curr Opin Ophthalmol 2005; 16:107–113. Honjo M, Tanihara H, Kameda T, Kawaji T, Yoshimura N, Araie M. Potential role of Rho-associated protein kinase inhibitor Y-27632 in glaucoma filtration surgery. Invest Ophthalmol Vis Sci 2007; 48:5549–5557. Grewal DS, Jain R, Kumar H, Grewal SPS. Evaluation of subconjunctival bevacizumab as an adjunct to trabeculectomy a pilot study. Ophthalmology 2008; 115:2141–2145.e2. Fontana H, Nouri-Mahdavi K, Lumba J, Ralli M, Caprioli J. Trabeculectomy with mitomycin C: outcomes and risk factors for failure in phakic open-angle glaucoma. Ophthalmology 2006; 113:930–936. Singh K. Antimetabolite application: science or voodoo? J Glaucoma 1997; 6:271–273. Cantor L, Mantravadi A, WuDunn D, Swamynathan K, Cortes A. Inhibition of vascular endothelial growth factor reduces scar formation after glaucoma filtration surgery. J Glaucoma 2003; 12:266–271. Picht G, Grehn F. Classification of filtering blebs in trabeculectomy: biomicroscopy and functionality. Curr Opin Ophthalmol 1998; 9:2–8. Coppens G, Maudgal P. Corneal complications of intraoperative mitomycin C in glaucoma surgery. Bull la Socieć�teć� belge d'ophtalmologie 2010; 314:19–23. Lama PJ, Fechtner RD. Antifibrotics and wound healing in glaucoma surgery. Surv Ophthalmol 2003; 48:314–346. Jampel HD, Musch DC, Gillespie BW, Lichter PR, Wright MM, Guire KE, Collaborative Initial Glaucoma Treatment Study Group. 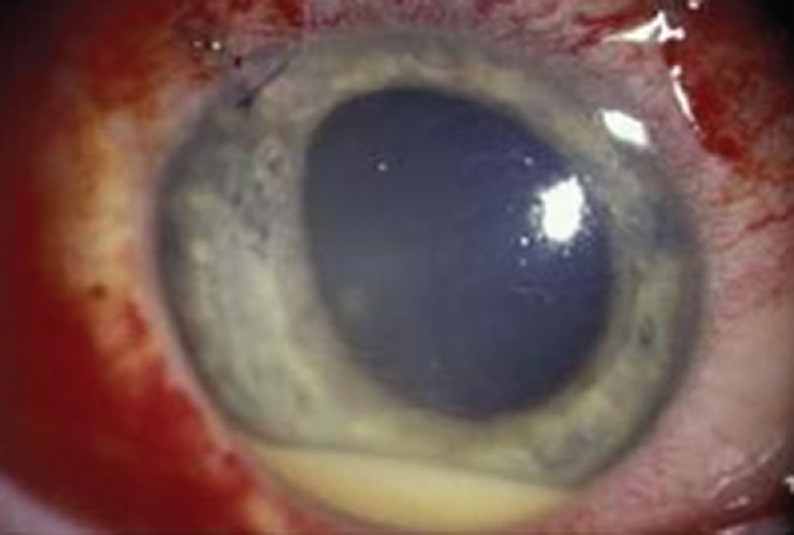 Perioperative complications of trabeculectomy in the collaborative initial glaucoma treatment study (CIGTS). Am J Ophthalmol 2005; 140:16–22. Edmunds B, Thompson JR, Salmon JF, Wormald RP. The National Survey of Trabeculectomy. III. Early and late complications. Eye (Lond) 2002; 16:297–303. Tan YL, Tsou PF, Tan GS, Perera SA, Ho CL, Wong TT, Aung T. Postoperative complications after glaucoma surgery for primary angle-closure glaucoma vs primary open-angle glaucoma. Arch Ophthalmol 2011; 129:987–992. Ashaye AO, Komolafe OO. Post-operative complication of trabeculectomy in Ibadan, Nigeria: outcome of 1-year follow-up. Eye (Lond) 2009; 23:448–452. Olayanju JA, Hassan MB, Hodge DO, Khanna CL. Trabeculectomy-related complications in Olmsted County, Minnesota, 1985 through 2010. JAMA Ophthalmol 2015; 133:574–580. Nakatake S, Yoshida S, Nakao S, Arita R, Yasuda M, Kita T, Ishibashi T. Hyphema is a risk factor for failure of trabeculectomy in neovascular glaucoma: a retrospective analysis. BMC Ophthalmol 2014; 14:55. Lim LA, Chindasub P, Kitnarong N. The surgical outcome of primary trabeculectomy with mitomycin C and A fornix-based conjunctival flap technique in Thailand. J Med Assoc Thai 2008; 91:1551–1557. Kohl DA, Walton DS. Limbus-based versus fornix-based conjunctival flaps in trabeculectomy: 2005 update. Int Ophthalmol Clin 2005; 45:107–113. Kattan HM, Flynn HW, Pflugfelder SC, Robertson C, Forster RK. Nosocomial endophthalmitis survey. Current incidence of infection after intraocular surgery. Ophthalmology 1991; 98:227–238. Katz LJ, Cantor LB, Spaeth GL. Complications of surgery in glaucoma: early and late bacterial endophthalmitis following glaucoma filtering surgery. Ophthalmology. 1985; 92:959-63. Aaberg TM, Flynn HW, Schiffman J, Newton J. Nosocomial acute-onset postoperative endophthalmitis survey. A 10-year review of incidence and outcomes. Ophthalmology 1998; 105:1004–1010. AGIS (Advanced Glaucoma Intervention Study) Investigators. The Advanced Glaucoma Intervention Study: 8. Risk of cataract formation after trabeculectomy. Arch Ophthalmol (Chicago, Ill 1960) 2001; 119:1771–1779. Collaborative Normal-Tension Glaucoma Study Group. Comparison of glaucomatous progression between untreated patients with normal-tension glaucoma and patients with therapeutically reduced intraocular pressures. Collaborative Normal-Tension Glaucoma Study Group. Am J Ophthalmol 1998; 126:487–497. Musch DC, Gillespie BW, Niziol LM, Janz NK, Wren PA, Rockwood EJ, Collaborative Initial Glaucoma Treatment Study Group. Cataract extraction in the collaborative initial glaucoma treatment study: incidence, risk factors, and the effect of cataract progression and extraction on clinical and quality-of-life outcomes. Arch Ophthalmol 2006; 124:1694–1700. Jampel HD, Solus JF, Tracey PA, Gilbert DL, Loyd TL, Jefferys JL, Quigley HA. Outcomes and bleb-related complications of trabeculectomy. Ophthalmology 2012; 119:712–722. Palanca-Capistrano AM, Hall J, Cantor LB, Morgan L, Hoop J, WuDunn D. Long-term outcomes of intraoperative 5-fluorouracil versus intraoperative mitomycin C in primary trabeculectomy surgery. Ophthalmology 2009; 116:185–190. Wong TT, Khaw PT, Aung T, Foster PJ, Htoon HM, Oen FTS, Seah SKL. The Singapore 5-fluorouracil trabeculectomy study: effects on intraocular pressure control and disease progression at 3 years. Ophthalmology 2009; 116:175–184.